Now it's time to get naked! We'll add the skins and clothing textures. There are several sets of skins, a bunch of tops, and a set of bottoms in the zip file. You will need to upload all of them to make the avatar have every clothing and skin option. 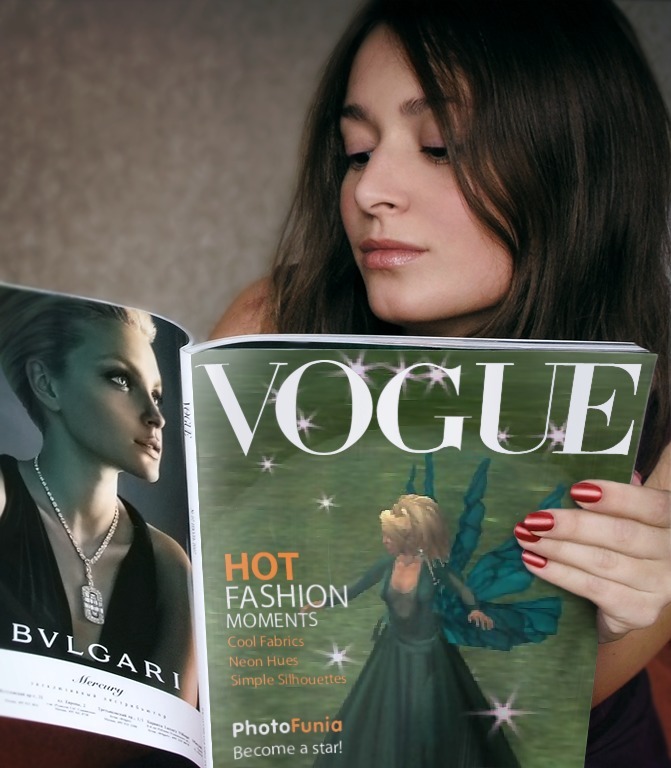 You can also add any Second Life clothing from any web site, or any clothes you make with the SL Clothes Previewer, provided that you put the correct names on the top and bottom. The format is "Name of clothes_Top" or "Name of clothes_Skirt Base". The name can be as long as 12 characters and the *_Skirt Base and *_Top is Case Sensitive. 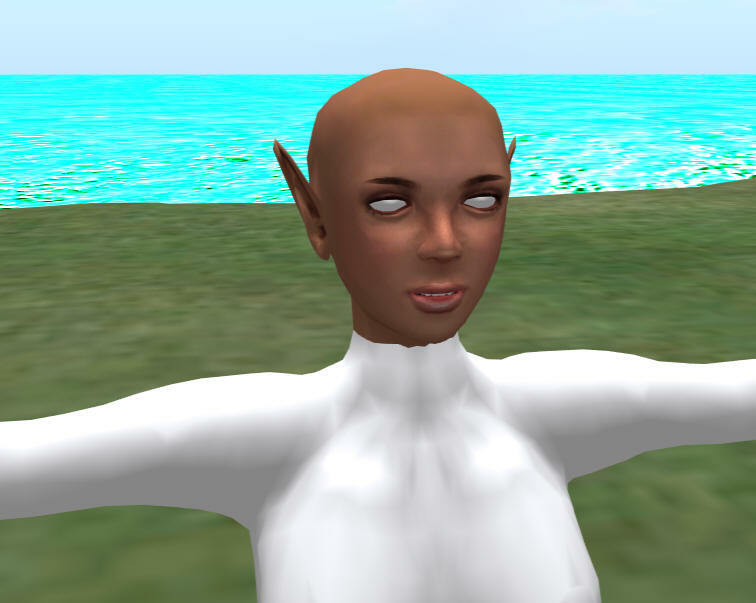 Tandy can use normal skin and clothing maps.But they have to be the textures, uploaded as images, and not Second Life skins. There are many free skins availablesuch as at Eloh Elliot's and StrawBerry Holiday. Also, Linda Kellie of http://www.lindakellie.com has many more skins, and is a fantastic resource for Second Life people, as well as Open Sim users. 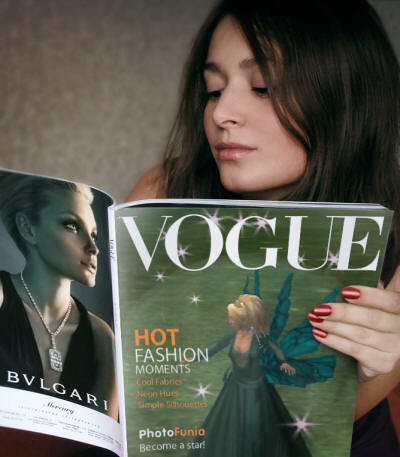 Her site works really when Questing for fairy clothing! For now, your Quest involves making Tandy wear the Starlite skin so we can see her naked, err, I mean, baked! After we are done in a later part, you will be able to change skins with a click of the mouse. Go to File->Upload and select "Bulk Upload". 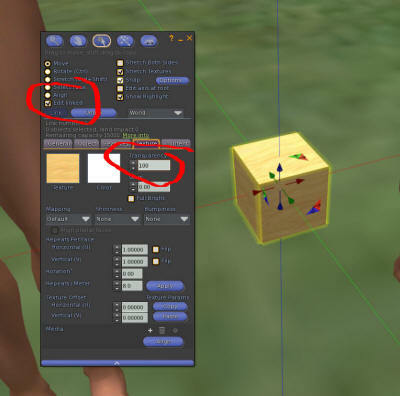 Browse to the folder "Avatar", and select ALL of the textures. This folder includes skins and clothing items, and all of it can be loaded at the same time. You can use any skin provided that you put the correct names on the skin. The format is "Name of Skin_face_skin", or "Name of Skin_upper_skin" or "Name of Skin_lower_skin", where the first part is the Menu name to choose the skin, an underscore '_', face|upper|lower|, another underscore, and the word 'skin'. For example, 'Starlight_upper_skin'. There is one rule other than the names: The skins must be JPG files and the clothing must be PNG with alpha layers. I do it this way so you will not see any annoying Z-axis flicker effects. It means that eyelashes on skins cannot be used ( a minor loss) , and I have taken care of that by deleting them already. 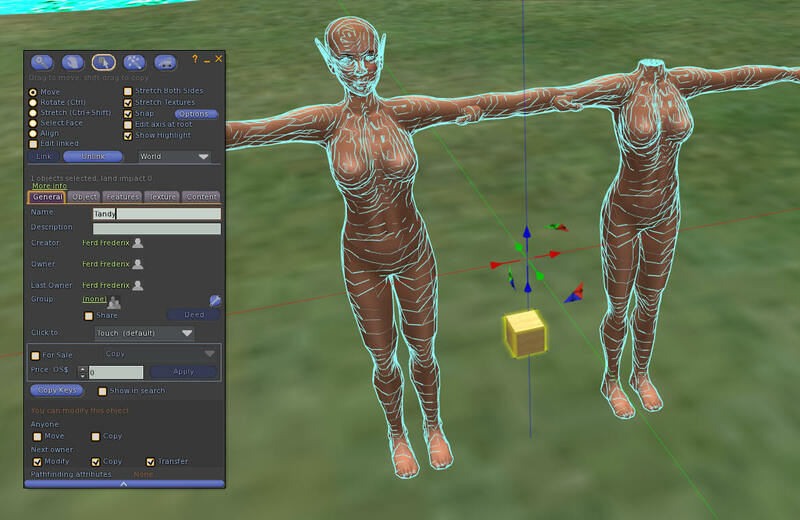 You can texture the avatar prims by hand now, if you want.You can paint the Starlight texture on each face and body piece manually so we can see them and give each part a name ( it helps). 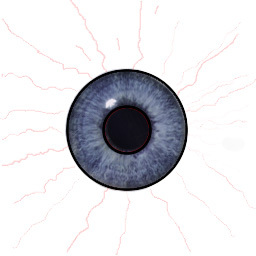 Add this texture to the eyes on your avatar. All of the individual parts MUST have special names in order for all this to work. It's absolutely necessary in order for the menu system to operate. What we will do is make a unique name for each body part. There will be two sets: one will hold the skins, and all start with the name 'avatar'. There is always an underscore '_" separator between that name and the body position which is 'head', 'upper', or 'lower'. Then the actual name of the part that will appear in the menu system is typed in. The second set we will copy, a headless set, will hold the clothing. So the second set of names begins with 'clothing', has an underscore '_', and with the word 'upper' or 'lower', and the last has the name. But we are not yet ready to copy this, we need to do some prep work and it will make it easier. Now zoom in on the copied sets: the ones on the right-hand side as seen when you look into their faces.Go into the prim editor, select Edit Linked Parts, click that head. Now press Ctrl-Shift-L to unlink all the prim. Delete the head. as we do not needs theis copy. Repeat for the eyes on this one side so we have only one set of eyes and one head on the left. Edit the avatar, and go into Edit Linked Parts. We will name each prim so we can change it with a script. There is another set of upper bodies, the ones on the right, that need a slightly different name. These use the word 'clothing' instead of 'avatar'. Add a small box somewhere. It doesn't really matter where. Now sweep select every object. Click the box twice so that it is the last item selected. Click Ctrl-L to link them all together. You may have to pause a few seconds after each click to give time for the server to send all the messages, as this is a complex object. Go into edit linked parts and make the box small and invisible with 1.00 Alpha. This box can be placed anywhere. Later, when we wear the avatar, we will find it is on our 'attachment point'. Now you can name your entire object 'Tandy'.